But tinkering with RSS never tires, the technology that is always declared dead, but just keeps working. 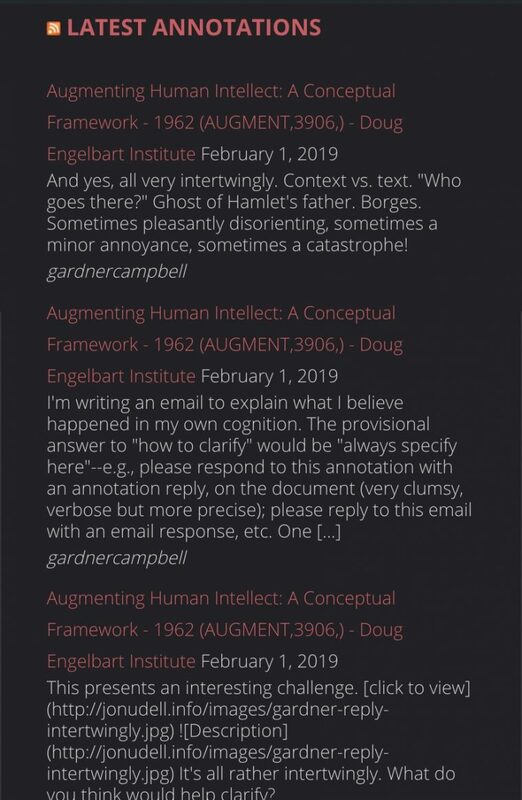 A current project I am doing with Gardner Campbell involves a lot of web annotation activity on a single, major document in Hypothes.is (you might as well peek, it’s almost ready). And quick peek at the results confirms, yup, there are the standard fields there. So using the standard WordPress widget it goes, Pretty easy. Entry fields for WordPress RSS Feed widget, options checked for showing item content, author, and date. I’m not linking much that it outputs the long title for every item; the feed is for all activity on this paper, and it seems… redundant. Looking at both of these URLs, I see the ID number for the annotation, so maybe there is a way to rejig the feed. So what I would like to do is replace the title item in the feed with something like “View Annotation” and re-write the URL. With some thought, this seems like a job for jQuery. It selects all list items with links having a class name of rsswidget and also (kist in case there might be some other feed widget in play) just ones linking to hypothes.is (this may be the fanciest selector I have ever done). Then, cycling through each one, $(this).html lets me replace the visible hyperlink text, and then modifying the link itself to swap the URL bits and append the part that provides the actual target document link. This is really just a one off. If I were to make it more of a general plugin, I’d probably add options for some things I have hard coded. The date and the “author” name (actually annotator) are just hanging out there, I’d like to make it a bit more readable. The date and the name of the annotator are just hanging out there. Can I make it a wee bit better? The journey starts in inspecting the structure of the widget content, each item is in a list. The date is tucked into an HTML span amd the author is in a cite tag (how often to you them?). This is where some new CSS magic I learned for another project come into play. using ::after and ::before after a selector, and using content:"something to add"; is a nifty way to add text before or after any thing in a web page (just text, no HTML). With just a bit of css I am able to add some verbs to the output! Verbs! The ::before in the source is a placeholder filled by CSS. This is all sounding like some minor gibberish, but I like how with a little bit of effort I am not stuck with what a widget provided. Were I more motivated, I might write my own widget code which would do this without all the duct tape. 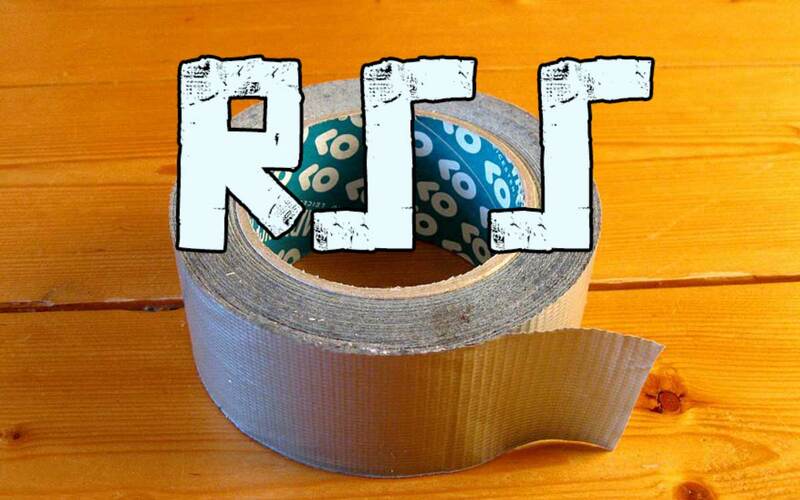 Well maybe a little less duct tape. Featured Image: Duct_Tape_2016 Wikimedia Commons image by Santeri Viinamäki shared under a Creative Commons CC BY-SA license. Modified by added RSS text with Duct Tape font. And I learn again. Thanks Alan.